Allergic reactions to a certain food can include diffuse hives, hoarse voice, wheezing, and, in severe reactions, low blood pressure and closing down of the windpipe. Medications such as antihistamines and skin creams may provide some relief from itching and rashes, but the best way to prevent future allergic reactions is to avoid the offending food in the first place. 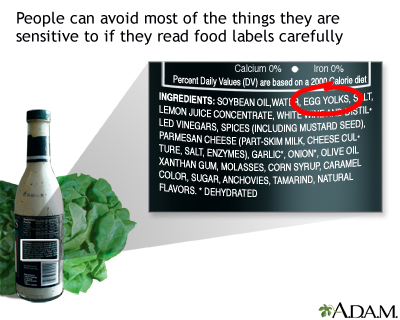 Reading the labels contained on most products is a useful way to find a certain food that a person may want to avoid.